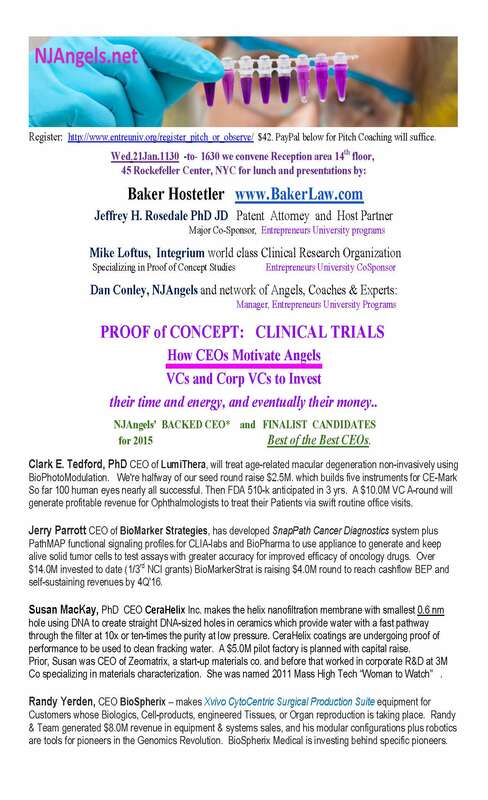 21 Jan 2015 Proof of Concept Clinical Trials program in NYC | NJAngels, BioAngels, BioGardenAngels by Silicon Garden Capital + Inc.
NJAngels, BioAngels, BioGardenAngels by Silicon Garden Capital + Inc. The special program held on 21 Jan 15 at the Baker Hostetler Law offices in NYC was a big hit with both presenting CEOs and investors. Dan Conley, As Managing Director for the New Jersey Angels Networks, Dan helps to build, bridge, and implement fundraising campaigns for them. Due Diligence, in the form of carefully examined criteria as VenturEvaluations are known, brings to the CEO an Investor's perspective - valuable Business Plan Materials Organization for the Entrepreneurs and their Teams. © 2019 NJAngels, BioAngels, BioGardenAngels by Silicon Garden Capital + Inc.. All Rights Reserved.